The Blue Wahoos and their delighted fans literally had a ball in Sunday's opening, home series finale. After a sixth-inning rally led to a 4-3 win against the Jacksonville Jumbo Shrimp in the newly-created Seafood Buffet Series rivalry, the kids among the crowd of 4,202 ran the bases, then many stayed to watch the first-ever, helicopter golf ball drop over center field at Blue Wahoos Stadium. Nearly 1,000 golf balls were emptied from two bags by Marty Stanovich, executive director of the First Tee of Northwest Florida, in a post-game event that coincided with the final round of the Masters Tournament and raised nearly $20,000 to benefit the local First Tee chapter for youth golfers. "I didn't get as close to the pin as Tiger did, but he has a lot more experience at that," said Stanovich, jokingly, who organized the event and made his first-ever golf ball drop from a helicopter provided by Pensacola's Hang Ten Helicopters. Stanovich aimed the golf balls near a flagstick planted in the outfield. One lucky winner with a numbered golf ball closest to the pin received $3,000 in the promotion. "I've seen this with tennis balls coming out, but never golf balls, so it's a cool thing," said Blue Wahoos reliever Ryan Mason, who chilled Jumbo Shrimp batters in the final two innings, including getting out of a jam in the eighth, to earn his second save. The Blue Wahoos (7-3), winners in four of the five games, hung 10 hits Sunday, including two apiece from centerfielder Tanner English, second baseman Luis Arraez and third baseman Brian Schales. After the first two weeks, Pensacola owns the best record in the Southern League. The Blue Wahoos will play their next five games against the Biloxi Shuckers in Biloxi, Miss. The Shuckers, Jumbo Shrimp and Blue Wahoos are part of a season-long chase for the best record. The winner will get namesake seafood from the other two teams for a dinner. Despite Sunday's game featuring 19 hits and four relievers between the teams on a wind-blown day, it was completed in two hours, 27 minutes. Mason was the difference-maker. He started the eighth and faced a two-on, one out situation after an error and botched force play. Unfazed, he threw wicked breaking pitches to strike out the next two batters. He retired the side in order in the ninth. He did this knowing with the wind blowing out to left, one missed pitch location could result in a two-run deficit. "In that situation right there when the leadoff guy gets on, whether it's a hit or an error, you've got to change your mindset as a relief pitcher" said Mason, 24, a California native who has advanced four levels in three years with the Minnesota Twins organization. "Fortunately, we have a great catcher (Brian Navaretto) who calls a great game and we have a great defense behind us who can make plays. It's all about making pitches and not letting the hitter get comfortable." The game began with home runs. Jacksonville's John Silvano hit a two-run shot in the first inning. The Blue Wahoos answered in the bottom of the inning when English led off with a homer. With the Blue Wahoos trailing 3-1 in the sixth inning, four consecutive batters knocked singles to lead off the inning, then Jimmy Kerrigan followed with bases-loaded double to right to erase the deficit and put Pensacola up 4-3. 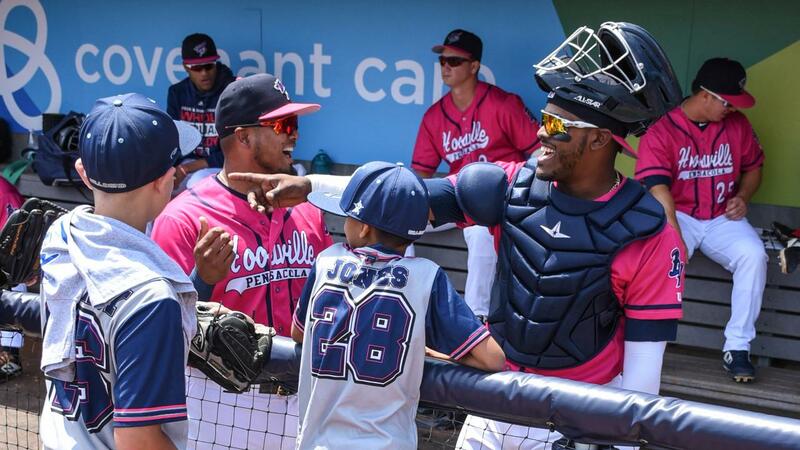 In their first home series as Twins affiliation, Blue Wahoos players marveled at the five consecutive games filled with three sellout crowds and nearly 24,000 attending. "This is by far the biggest crowd that I have played in front of in the minor leagues," Mason said. "We can't play this sport without the fans. If the fans don't exist, then we do not play baseball. "So it is always amazing to be able to win some games for the people who want to come out and support you." Earlier Sunday, the Blue Wahoos learned starting pitcher Devin Smeltzer, who threw 8.1 scoreless innings in Friday's win and has not allowed a run in two starts, was named the Minnesota Twins' minor league pitcher of the week. The post-game, helicopter golf drop included two challenges. The first was an unaware visitor outside the stadium flying a kite over Pensacola Bay. That had to be reeled in before the helicopter took off. Then as he was set to drop the golf balls, Stanovich emptied one bag, but realized the second one had wedged underneath the aircraft seat. me endangering myself," said Stanovich. "It was a lot of fun. That was our first golf ball drop It was nerve-wracking but it was good," said pilot Ross Ansell, owner of Hang Ten Helicopters and owner of a utility company that inspects and repairs power lines. Milkshakes were one of the biggest sellers among the new concession items at Blue Wahoos Stadium. The milkshakes were sold at the Wheelhouse Diner on the first base side. Eric Kroll, former UWF baseball player and director of food and beverage services for Blue Wahoos Concessions, said more than 350 had been sold the first four games.